Howard and I went to the Central Terminal last night to say goodbye to our friend Mike Miller. Mike Miller was in charge of the restoration of the Central Terminal and he died unexpectedly the other day. He was only 51. Zut alors, that is sad. 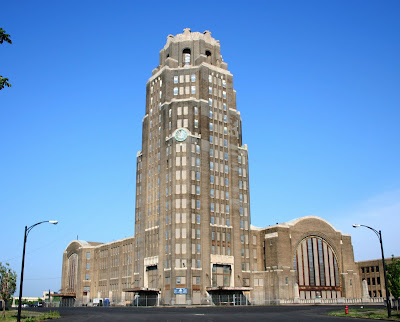 That is Buffalo's Central Terminal pictured above! I cannot say what it was to see Mike lying there beneath its great clock as trains rumbled past outside. Hearing the trains was like turning back the calendar and Mike would have loved that. He loved the Central Terminal so much. You feel better though when you gather at an event like this, instead of feeling bad in your own home. Our friend "Airborne Eddy" was there and his presence is comforting. And Father Anzelm was there from Corpus Christi Church. Other people know priests with normal names like Father Tom or Father Jim or Father Mike. Not me! I know Father Anzelm and Father Secondo and Father Butch. Anyway Father Anzelm was wearing his white cassock, cracking jokes, being a comfort. People who comfort you in situations like this, there is a special place in heaven for them. Because how do you get your mind around something like this? A loss like this? Speaking of death, do read -- it will crack you up, I promise -- my, ahem, Music Critic Web log post today on the late Erich Kunzel. Erich Kunzel, the star pops conductor, just died. He was in Buffalo several times and there is this thing that happened to him backstage at Kleinhans Music Hall that I still laugh about. Son of a sea cook, here we go again, talking about Kleinhans! So we beat on, boats against the current, borne back ceaselessly into the backstage of Kleinhans Music Hall! To the couch where Leonard Pennario sat. 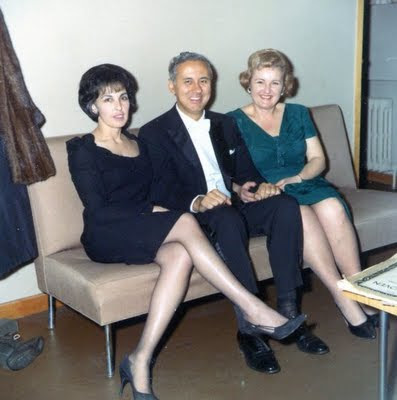 What happened to Erich Kunzel backstage at Kleinhans could only happen here in Buffalo, I have to say that. It is one of those things that add up to make Buffalo the greatest city in the world. It is sad to lose Erich Kunzel because these conductors, they become part of the background of your life. Also he was the godfather of Len Hoeglmeier who was the greatest bartender I have ever had the privilege of knowing. I will have to send Len a card to let him know I am thinking of him. One more thought on death. My friend Lizzie and I were talking the other day as we put up the twinkly lights for Howard's birthday. And Lizzie mentioned that when she died she wanted to be cremated. I cannot imagine being cremated! "I want my ashes taken to Scotland," she said. I did not know Lizzie had such strong feelings for Scotland! But she is Scotch and her grandparents are buried there and that is where she wants to go when she is dead and gone. I like writing "Scotch" and not "Scottish" because Scotch makes me think of the whiskey. Now, my family is from Bavaria and Bavaria is beautiful but that is not where I want to be taken when I die, I will tell you that right now. I want to go to St. Anthony's Church and I want a meticulous Roman Catholic funeral in the Latin rite with every "i" dotted and every "t" crossed. I want everything in order so when I cross over there is no problem and I am not tripped up on any technicality. That is what I love about Catholic funerals. It is not a time for reminiscing and telling funny stories. In a traditional Catholic funeral there is no eulogy. There is business to take care of. There are i's that have to be dotted and t's that have to be crossed and there are prayers and formalities and things that have to be done a certain way. That is what I want! No Scotland for me! No urns! But I will drink Scotch, anyway. If you really want to turn back the calendar, you do NOT refer to or address a Catholic priest by their first name, much less a nickname.